Solar panels are usually connected together in series. This means that they are daisy-chained in the same way that old fashioned fairy lights were connected together. A number of panels connected in this way is called a ‘string’. Being connected in this way means that the electrical current flows through every panel in the string. There may be more than one string in larger installations. The string(s) are then typically connected to an inverter, which converts the d.c. electricity from the solar panels into a.c. electricity that we can use. If any of the solar panels are shaded, the current cannot flow as easily and therefore the output from the whole string is reduced. Panels in a string must all be in the same pitch and orientation, or the string current will be limited by the worst orientated panel(s). Panels are manufactured to a tolerance, typically 3 to 5 percent. The current flowing through the string will be limited to the lowest performing panel(s). 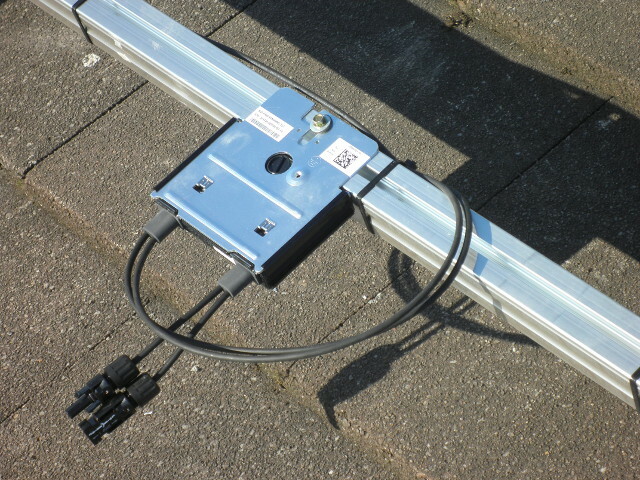 The performance of the solar panels cannot be monitored individually. String type inverters are not available for very small systems consisting of one or two solar panels. Some manufacturers have designed products to combat the disadvantages of using strings of solar panels by processing the output of each solar panel individually or in pairs. These come in the form of micro-inverters and power optimisers. In a system using Solaredge power optimisers, each panel has its own optimiser that sits underneath the panel. The optimiser adapts the power output of the solar panel by matching the electrical current to that of the other solar panels and optimisers. These can then be connected together to make a string that does not have any of the current limitations of a conventional string. The string is then connected to a web-connected inverter that communicates with the optimisers, allowing monitoring of all the solar panels individually. An example of this monitoring can be seen by clicking here. Solaredge power optimisers have a 25 year warranty. The inverters have a 12 year warranty, which can be extended if required. Some solar panel manufacturers produce panels with built-in optimisers, which reduces the overall cost. Contact us for a quotation for a Solaredge optimised system. An alternative approach is to use a tiny inverter, or micro-inverter, for each panel. This has many of the same advantages of the Solaredge system, but as the mains electricity is produced behind each panel, there is no requirement for a separate inverter. This can be useful if a very small system is required, but it is usually much cheaper to use the Solaredge approach and the warranties on micro-inverters are shorter (typically 10 years). Various manufacturers produce micro-inverters.